HomeApple FM NewsHappy 1st Birthday Apple FM! 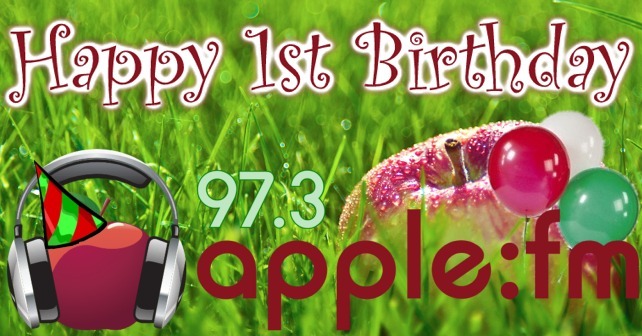 Happy 1st Birthday Apple FM! Yes, Apple FM is 1 today! We’ve had a great year and we have been so lucky to of had the year we’ve had! We want to thank every single person that has helped Apple FM along the way, this goes to colleagues, sponsors, partners and of course you, the listeners. So what have we achieved in our first year? Well, we reached over 100,000 hits on our website www.applefm.co.uk. We have over 2,000 likes on Facebook and over 1,500 followers on twitter! We are consistently the number 1 radio station listened to at Musgrove Park Hospital and we are going from strength to strength with a constant stream of visitors into our studio and solid working relations with other community organisations. With our special remit for the caring community of Taunton, we are working hard to keep our listeners informed and engaged in local affairs, at the same time providing entertainment across a wide spectrum. So stay tuned to 97.3 Apple FM for another exciting year of the best in community radio!